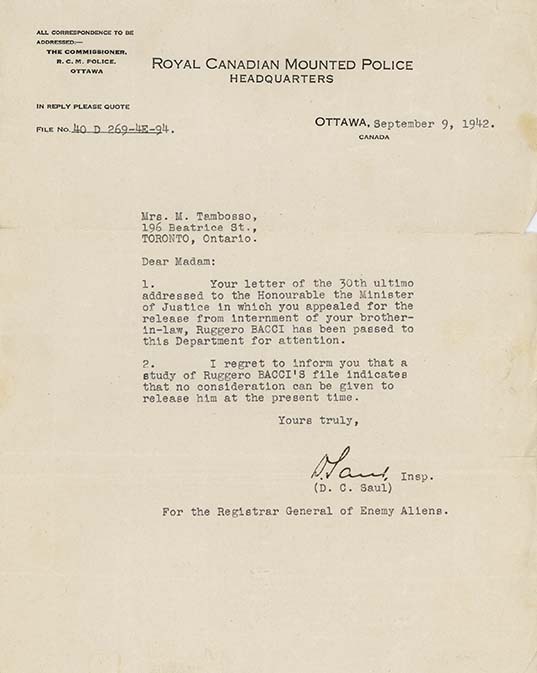 Letter from D.C. Saul (RCMP Inspector, Registrar General for Enemy Aliens), to Margaret Tombasso, September 9, 1942, regarding the internment of Ruggero Bacci. Saul notes that Bacci is not being considered for release. Margaret Tombasso is identified as Bacci's sister-in-law. It's unclear what her relationship was, if any, to Alessandro Tambosso, an internee also from Toronto.